A linear route along the trackbed of a former railway, parallel with the Ashbourne-Buxton A515. 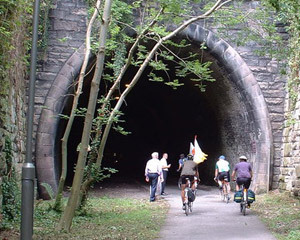 It begins with a 350m-long tunnel out of Ashbourne then makes its way north past Tissington, Alsop and Hartington to merge with the High Peak Trail near Parsley Hay. Easy gradient and firm surface throughout, with picnic tables and toilets at the former Tissington and Hartington stations. Cycle hire available at either end.